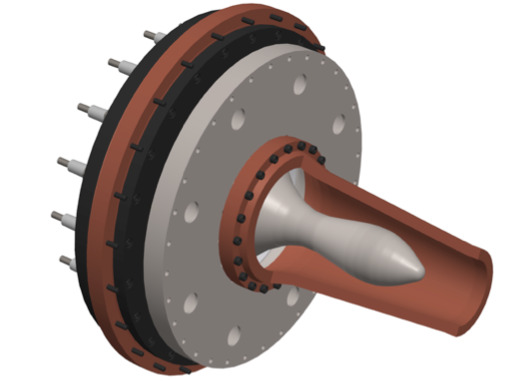 At the core of the hyperjet fusion approach is a plasma liner that implodes and ignites a magnetized target plasma. The plasma liner is formed by the merging of a spherical array of plasma jets or micron jets or their combination. The hyperjet fusion reactor is envisioned to be a 20-ft (7-m) diameter sphere arrayed with approximately 600 plasma guns. The illustration below is a simplified cut away diagram of a conceptual hyperjet fusion reactor firing sequence. The term “DT” in “Step 2” stands for the deuterium-tritium fuel plasma, while “High-Z” denotes high atomic number for the atomic species making up the plasma liner. The high atomic number gives rise to a high-density plasma, as well as a rich repertoire of atomic physics processes including ionization and radiation, which give rise to the important hypersonic effects of the supersonic liner during its radial convergence, helping to maintain its high Mach number and compressibility. 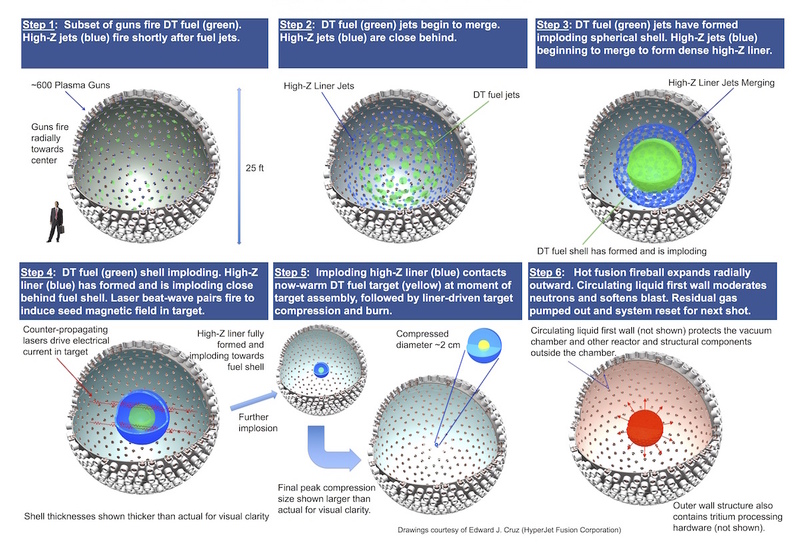 High density plasma is needed in the plasma driver to provide greater ram pressure to compress the “DT” fuel plasma. The laser beat-wave pairs in “Step 4” stir the electrons in the plasma fuel target to create the magnetic field. Other methods to introduce magnetic fields in the target plasma are also possible and are under investigation. The magnetic field helps prevent heat loss out of the fuel target during its compression by the plasma liner, enabling the target to be heated efficiently by the compression to fusion temperatures. The plasma jets are launched with velocities in the range from 50 – 100 km/s. The entire hyperjet firing sequence from “Step 1” to “Step 6” takes place within 30 to 50 microseconds is repeated approximately once every second. There are potentially several ways of producing these plasma jets. Presently, we are using coaxial plasma guns with contoured shaped electrodes. © HyperJet Fusion Corp. All rights reserved.